Giordan, a former Woodruff swimmer, finished 2005 as the third-rated 200-meter breaststroker in the United States. The Purdue junior finished second in the Big Ten swimming and diving championships in the 200 breast last February. In August, he briefly held the World University Games record in the event, with a time of 2 minutes, 13.71 seconds in lzmir, Turkey. It was his international swimming debut. Whenever the promotion of a sports project or other worthwhile activity takes place in the Peoria area, Pete Vonachen's name appears in the list of supporters. An avid sports enthusiast and premiere restaurateur, "Pete" saved professional baseball for Peoria when he purchased the town's Class A Midwest Franchise after the 1983 season, turning it into a model for the nation. Stressing first-class facilities and a belief that fans should have fun at the ball park, Vonachen, with the cooperation of the Peoria Park District, turned Meinen Field into such an attractive park that it won the 1987 Midwest League Gold Award for the most outstanding facility in the league. Vonachen's team has led the Midwest League in attendance in three of the four seasons he's been owner and last year set an all-time league mark of 196,000 fans. In 1984, he switched Peoria's major league affiliation to the Chicago Cubs; and in 1985 he was named Class A Executive of the Year by the Sporting News. 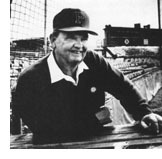 Pete was a past winner of the Neve Harms Meritorious Service to Sports Award, served on the Peoria Park Board for several years, and was Tri-County Outstanding Sports Figure of the year in 1985. One of the most recognizable personalities in Central Illinois, Peoria baseball fans are fortunate to have such a person with his vitality and driving ambition.